The Chicago Teachers Union is hosting the Trinational Conference in Defense of Public Eduction on May 9, 10, and 11 here in Chicago. The opening session of the conference on Friday evening, May 9, is open to the public. Registration for the remainder of the conference has already closed. Prior to the opening of the conference, attendees will visit the U.S. Department of Education and the Mexican Consulate in Chicago to deliver a message about the corporate attack on democratic public education. 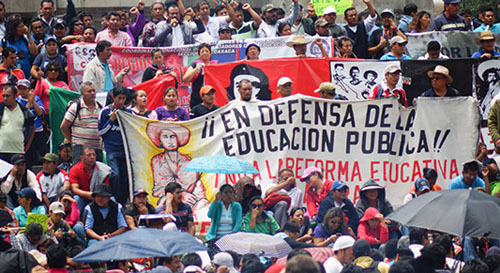 Teachers across Mexico have been fighting against corporate attacks on public education, including occupation in Mexico City.The opening session of the Conference will be held at UIC Friday, May 9, 6:30�8:00 PM, UIC Behavioral Sciences Bldg (1007 West Harrison Street). Union leaders from Mexico, Canada and the USA will discuss the neoliberal attack on public schools and the fight back from the teachers' unions. "From Oaxaca up to Chicago to Quebec, budget cuts to schools and colleges left fewer teachers and staff serving more students with fewer resources, for less pay," a CTU statement said. "Meanwhile, private companies got more public money to run charter schools, give standardized tests, and sell online programs." Faculty and staff in public education are sick of seeing more students struggle in school as politicians demand more budget-cuts and more time for testing instead of teaching. It's like having to sweep up behind one shock-wave after another, while being blamed for them. But instead of feeling powerless, educators from Mexico, Canada and the U.S. are coming to Chicago in May to strategize about the next steps in their mutual defense of public education. From Oaxaca up to Chicago to Quebec, budget cuts to schools and colleges left fewer teachers and staff serving more students with fewer resources, for less pay. Meanwhile, private companies got more public money to run charter schools, give standardized tests, and sell online programs. People fought back�teachers launched strikes and protests across Mexico, which still continue, thousands of students in Quebec held a general strike, faculty in California's State University shut down whole campuses for a day. From May 9 to 11, 2014 they will be at the 11th Biennial Conference of the Trinational Coalition to Defend Public Education, hosted this time by the Chicago Teachers Union. People are learning that they face the same political attacks, often led by the same groups like the Pearson company and the Gates Foundation. It is time to develop a more united strategy of resistance! Hear Union Leaders from Canada, Mexico, Puerto Rico, and the U.S. ! CHICAGO��The Chicago Teachers Union (CTU) this weekend will host educators from Canada, Mexico and the United States at the 11th Conference of the Tri-national Coalition to Defend Public Education. 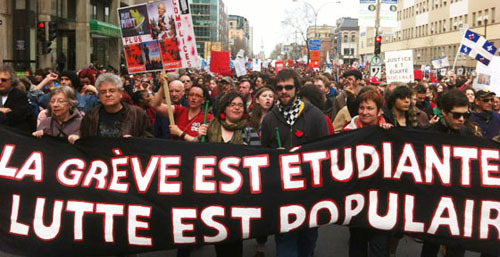 The three-day conference will focus on a call for accountability in the financial sector and the elimination of divestment in public schools, as the participating countries currently face drastic school budget cuts, rising college tuitions, draconian reductions in retirement security and deep gaps in the availability of early childhood programs. CTU reps and conference attendees will visit the Canadian and Mexican consulates and the regional office for the U.S. Department of Education on Friday starting at 2:30 p.m., where educators from each country will share a letter to the governments of the three countries on the ever-pressing need to create a continental plan that raises living standards for everyone. WHAT: Visits to the Consulate General of Canada, regional office of the U.S. Department of Education and Consulate General of Mexico for delivery of letters proposing a shared plan to: close corporate loopholes through policies like a Financial Transaction Tax and Fair Tax policies; stop blaming teachers, students and the broader community for the divestments in our schools; and invest in our school communities with universal early childhood programs, free college access, parent and community programming and services within the school, reduced class sizes and a commitment to providing the schools that the students on our continent deserve.